A commercial jumbo jet carrying hundreds of passengers flew into Auckland Airport with a panel missing from its wing, and the problem went unnoticed until after the plane had landed. Singapore Airlines flight 285, with 269 people on board, touched down on August 14 with only one set of fully functioning wing slats after a 20cm panel fell off while it was in the air. The plane had just flown nine hours and 40 minutes non-stop from Singapore. Airport emergency crews were not alerted because it wasn't until the Boeing 777-300 was on the tarmac that ground staff noticed a section was missing. One astonished airport worker said: "A bite out of a wing had gone." The news comes as engineers investigate the loss of cabin pressure on a Boeing 737 flying into Auckland this week. The Civil Aviation Authority of Singapore said it had communicated with the airline about flight 285. A spokesman said: "We have ascertained that the missing panel on the outboard wing slat did not affect the airworthiness of the aircraft." The spokesman said the missing panel, measuring about 20cm x 17cm, was from the right-wing slat near the middle of the wing. A Singapore Airlines spokesman said it was only a minor issue and passengers were never in danger. Fred Russo of Botica Butler Raudon Partners said pre-flight checks before the plane was due to return to Singapore revealed damage to an outboard wing slat. "As the damaged slat is a secondary flight control structure and there are several of these on each wing, and as the damaged area was small, there were no safety issues," he said. The plane stayed at Auckland Airport in an Air New Zealand hangar for 48 hours until a replacement part was flown in and repairs were made. An Airways Corporation of New Zealand spokeswoman said if the crew had detected a problem during the flight, air-traffic controllers would have prepared for an emergency landing. Aviation expert Peter Clark said the Boeing 777 was one of the safest craft in the sky but there would probably be an investigation by the airline and manufacturer to determine why the panel fell off. Slats on the underside of the wing drop down when an aircraft comes in to land. Clark said it was a highly unusual occurrence and there would have been no way the flight crew would have noticed it was missing. 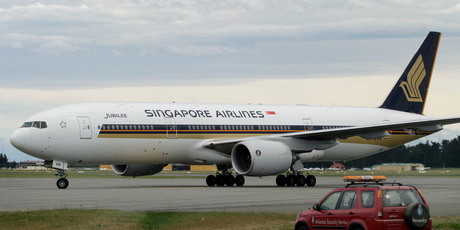 According to the company website, Singapore Airlines has seven Boeing 777-300s that are primarily used on secondary routes. The damaged craft took off from Changi Airport, flew over the Banda Sea, Northern Australia and the Tasman Sea before landing at Auckland.